Doug Ford is facing criticism for suggesting Ontario has to "take care of our own" before pushing for immigrants to move to northern Ontario. Facing criticism for suggesting Ontario has to "take care of our own" before pushing for immigrants to move to northern Ontario, Progressive Conservative Leader Doug Ford repeatedly refused to explain his comments, instead saying he is supportive of new Canadians and immigration. At a news conference Saturday, Ford was asked four times to explain what he meant by the remarks, but would not elaborate. Instead, he slammed his opponents for seizing upon the remarks he made at the northern issues leader's debate Friday. 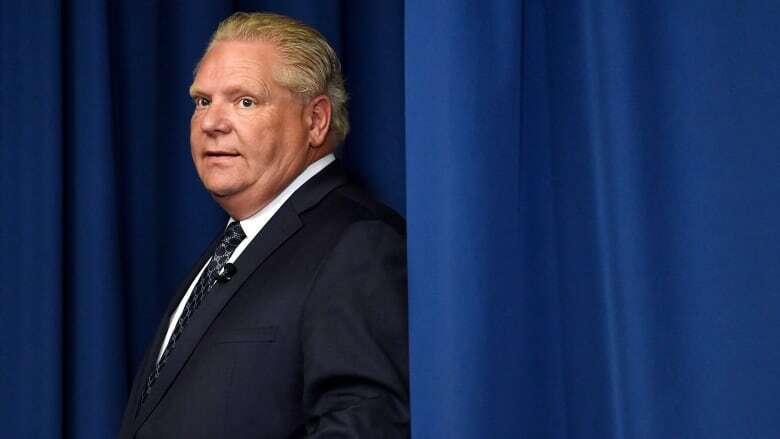 "My opponents are playing politics — you know that," Ford said. "There's no politician that probably has more support out there for new Canadians. Ford Nation's full of new Canadians." Ford said that if he's elected June 7, his government will create more spaces for apprenticeships and break down barriers that keep credentials held by new immigrants from being recognized. "We take care of new Canadians," Ford said. "We take care of immigrants coming to this country. They call me personally on my phone. If you have credentials from other countries, we will make sure that we do everything in our power ... to recognize those credentials and speed up the process." In a statement early Saturday, Ford's campaign spokeswoman Melissa Lantsman said the Tory leader's comments at the debate are being mischaracterized by his political opponents. "Doug Ford is completely supportive of new Canadians and immigration policies that welcome immigrants," she said. "Ford Nation is a diverse group of supporters, including strong support in immigrant communities." During Friday's northern debate, Ford said the government would have to exhaust every option for employing locals before relying on immigrants to fill jobs in sparsely populated areas. Lantsman said Ford is open to the northern Ontario immigration program, but believes that people in the north have felt "left behind." "We need immediate policies to help those currently living in these communities," she said. Premier Kathleen Wynne said Ford would have to explain exactly what he meant by the comment, which she said was "very disturbing." Both Wynne and NDP Leader Andrea Horwath said they would consider an immigration pilot project to combat population decline and draw workers to the northern reaches of the province, similar to one already in place in Atlantic Canada. Wynne said that in a country where everyone except Indigenous people are immigrants, she doesn't know who Ford considers "our own." Meantime, Horwath called Ford's comments on immigration "worrisome" not only for herself, but for the northern municipal leaders who hosted the debate. "I have to say I was a little bit shocked," she said Saturday. "I've heard that language used by people who are suggesting that newcomers are not welcome in the province or in our country, and that's not an opinion that I share." She added that Ford's response showed he did not understand what the municipal leaders were saying with their question on facilitating immigration to the region. "They want more newcomers in their communities, they want to ensure the local economy has more skilled workers and more population," she said. "While the municipal leaders were basically saying, 'Let's find the way to roll out the red carpet and welcome newcomers in,' Mr. Ford's comments seemed to be completely opposite of what they were asking for."